Tammy is a resident of Indiana and is the yin yoga teacher at Lotus Yoga studio. She has been teaching yoga for the past 4 years and at Lotus Yoga Studio since May, 2013. Yin is her passion because of its many, many benefits. Personally, it was Tammy’s class that got me back into yoga after several years away from it. So I asked her to share with us more about yoga, in particular, yin yoga. Hi Tammy, Thank you so much for your time to talk about YIN YOGA with our readers. I started doing yoga about 12 years ago. How did you first get started practicing yoga? I was always attracted to yoga. Yoga was something that I always wanted to try. Then one day I was watching Oprah and she was interviewing a woman who was attending a hot yoga Vinyasa class. It “spoke” to me somehow. The heat, the yoga, the peacefulness. I looked online and found a hot yoga class in Indianapolis. I was very fortunate to go to the class and meet my yoga teacher, Amy. I don’t know how it may have turned out if she had not been the teacher. I do believe students find the teachers that they need. Seek and you shall find. A few years after I started driving to Indy for my yoga classes Amy opened her own studio in Fishers. So of course, I followed her there! Meanwhile, I was also taking many other yoga classes and meeting many other yoga teachers. But there was something about the way Amy taught and her yoga philosophy and the way she shared yoga, I was always drawn back to her classes. Yoga was actually the first “exercise” that I ever did that I always left me wanting more. I just couldn’t wait to do it again. I had no idea why that was, and I didn’t question it; I just kept going back to yoga classes because I couldn’t felt driven to it. And like I said, I just couldn’t wait to do yoga again. I realize now that what was happening, was that I was experiencing what yoga does for the body mind and soul…..without even realizing it. Later when I took teacher training I learned about all the ways that yoga is to “designed” to benefit us and how it works. At the beginning though, I was just experiencing it. Why did you decide to start teaching yoga? I really hadn’t thought about teaching yoga or taking a teacher training course. But about a year after Amy opened her studio, she offered her first teacher training class. Amy talked to me one day and told me that she thought I might like to take the YTT course. She said it could deepen my own practice even if I never taught. Of course, that appealed to me because by then, I had completely fallen in love with yoga. So I took the teacher training course to deepen my own practice. Again, I never intended to become a teacher myself. Near the end of my teacher training, a co-worker’s daughter asked me a question that changed my perspective. She asked if I was going to teach, or if I was going to “keep it all to myself”. That’s how she phrased it! Keep it all to myself. Wow. That was a lightbulb moment. I immediately knew that once you have this knowledge you cannot keep it to yourself. You have to share it. And you want to share it. What kinds of yoga do you like best? When I go to yoga classes I usually attend hot Vinyasa and Yin yoga. 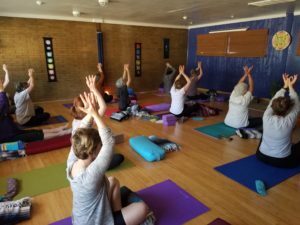 Why do you focus your teaching on yin yoga? I was first exposed to Yin Yoga during my teacher training. I started taking yin classes from different teachers and I realized that it was truly my passion. 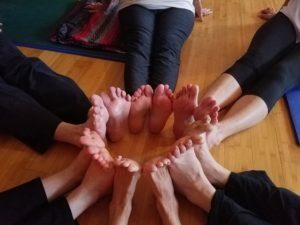 I wanted to share yin yoga with others because of the benefits and because of the meditative aspects. And the mindfulness. And the balance it can bring to our very Yang lifestyles. I focus my teaching on Yin Yoga because of the passion I feel about it and what it can do for the human body, soul, and mind. The benefits are many. I have experienced those benefits and my students share their experiences with me also. Yin Yoga benefits all ages of people. And it helps us keep our spine and hips mobile and hydrated and supple. A must for healthy aging. What is your specific Yin training? I go to Every Yin class I can find. Even when I am on vacation I find yoga classes. I also take additional training courses in Yin Yoga and workshops often. I have studied with Biff Mithoefer at the ashram in Virginia. And I am enrolled in a 300 hour Taoist yin yoga teacher training and Cincinnati Ohio currently. My teacher there, Matt E., has studied with Paul Grilley. I take additional trainings to deepen my knowledge and because I want to continue growing so I can bring what I learn to my yin students. What do you want people who don’t practice yoga to know about it? 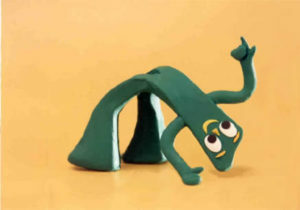 I want people to know that you do not have to be a Gumby to practice yoga. Yoga meets you where you are. There are many, many benefits. And as you begin to practice yoga, you will begin to experience the benefits; we don’t even have to explain them. I want people to know also that yoga is a science; it works because it is designed specifically for the health of the human body. YOUR body, no matter what its current state is. What closing remarks would you like to leave with our readers? I share yoga because I believe it makes us better and it makes us happier and it allows us to be more mindful as it teaches us how to breathe. Yoga teaches us how to slow down and breathe. We unlearn the things we are taught that do not benefit us. That is very powerful! Layer by layer we uncover our true selves. Our authentic selves. And as we do so, we find our voice and we speak Our Truth. Maybe we cannot solve all the world’s problems and save everybody. But we can learn to love ourselves, really love ourselves. So then we can really love others – the people we come in contact with every day. It has a ripple effect. The people we come into contact with daily see our light, and in that light, they recognize their own light. Together, we all cultivate and shine our lights, giving others the permission to shine theirs. And that ripple effect just keeps going and going. It is a beautiful thing to be a part of all of that! Thank you, so much, Tammy! I really appreciate your time to share here on the Lotus Yoga Blog about your experiences and your love for yoga, and I also appreciate your beautiful spirit and your generosity with yourself and your yoga!